Armes, Alice. English Smocks with Directions for Making Them. Leicester, England: Dryad Press, 1971. Includes embroidery designs from several counties. Banateanu, T., Foncsa, G., and Ionescu, E. Folk Costumes, Woven Textile and Embroideries of Rumania. Bucharest, Romania: State Publishing House for the Literature and the Arts, 1958. Bossert, Helmuth T. Folk Art of Europe. New York: Praeger, 1953. Embroidery design and costume information. Bradshaw, Angela. World Costumes. New York: Macmillan, 1953. Traditional world costume, with a chapter on England. Brensztejn, Michael. "The Peasant Art of Lithuania," in Viltis 25:6 (Mar-Apr, 1967), pp.6-9. De Giafferi, Paul Louis. History of Feminine Costume of the World. Fel, Edit. Hungarian Peasant Embroidery. London: Batsford, 1961. Haire, Frances H. The Costume Book. New York: Barnes, 1937. Haire, Frances H. Folk Costume Book. New York: Barnes, 1926. Hill, Laura May. "Authentic Folk Costumes for Folk Dances (National Country and Character)." M.A. thesis, George Peabody College for Teachers, 1925; Authentic Costumes for Folk Dances. Journal of Health and Physical Education, February 1930. Hubbard, Sarah. "A Study by Periods of Costumes for Dances." M.A. thesis, George Peabody College for Teachers, 1929. Kirin, Vladimir. Narodne Nošnje Jugoslavije. Zagreb, Croatia: Naklad Naša Djeca, n.d.
Kostumy K Tancam Narodov SSSR. (in Russian). Moscow: ? : 1957. Leeming, Joseph. The Costume Book for Parties and Plays. Philadelphia, New York: Lippincott, 1938. Lepage-Medvey, E. National Costumes. Paris: Hyperion, 1939. History and illustrations of costumes of Austria, Hungary, Poland, and Czechoslovakia. Little Neighbors of Many Lands. New York: Milton Bradley, n.d.
Mann, Kathleen A. Peasant Costume in Europe, combined edition, 2 vols. in 1. London: Black, 1931, 1950; New York: Macmillan, 1950. Ample illustrations of costumes from 18 countries. McWhorter, Frances Elizabeth. "The Significance of the Costume in the Dance." M.A. thesis, George Peabody College for Teachers, 1931. 72p. 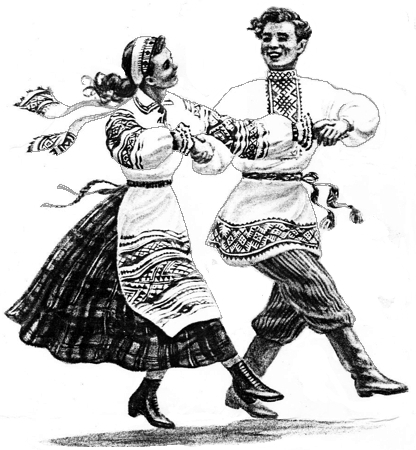 National Costumes of the Slavic Peoples. New York: Bureau on Pageantry and the Drama, Woman's Press, 1920. Nott, F.C. Stage and Fancy Dancing. 1896. Nylen (or Nylen), Anna-Maja. Swedish Peasant Costume. Stockholm: Nordiska Museet, 1949. Backgrounds and color illustrations for 65 costumes from 47 districts. Pettigrew, Dora W. Peasant Costume of the Black Forest. London: Black, 1937. Descriptions and illustrations. Primer, Kathleen. Scandinavian Peasant Costume. London: Black, 1939. Descriptions and illustrations. Racinet, M.A. Le Costume Historique. Paris, 1888. Rosenberg, Adolf. Design and Development of Costume. London: Foyle, 1925. Šmiroris, K., and Sotková, Blazena. National Costumes of Czechoslovakia. n.p. : Artia, n.d. Detailed color photographs. Tilke, Max. Costume Patterns and Designs: A survey of costume patterns and designs of all periods and nations. New York: Praeger, 1957. Approximately 2,000 patterns and many illustrations. Vaclavik, Antonin, and Orel, Jaroslav. Textile Folk Art. London: Spring Books, n.d.
Where Folk Costume Survives Today. In Mentor, 11:1-16 (May 1923).